I love all type of Nyonya Kueh . Is not from my heritage. However staying in Asia we do have different mixed of cultural group staying harmony together. Peranakan is another cultural group with full of strong favour taste of food and snack. Ang Ku Kueh is one of the snack that is our tea moment snack. It has many version and filling. For this snack I love the peanut fillings. Some recipe will iincorporate coconut milk in it. Which will really enhance the fragrance of this kueh and trust me everything that has coconut in it taste the best. 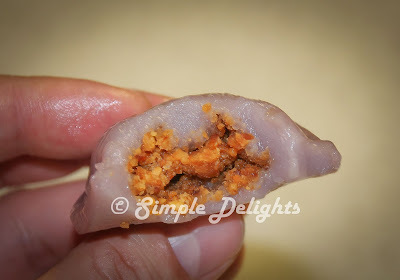 There are so many Ang Ku Kueh recipe in the internet and for this recipe I follow this link -> HoneyBeeSweets. 1. Place all ingredient expect coconut milk in a large mixing bowl. 2. Slowly add in the coconut milk to the form a soft dough ( not wet). Cover it with cling wrap and rest for 10min. 3. Divide the dough into small portion and gentle press it flat on your palm. 4. Scoop the filling in the center and seal it. Roll it into a ball shape. 5. Press the dough with filling into the mold grease with oil. 6. Knock the kueh out from the mold and place it on top of a banana leafs. 7. Preapare a steamer and steam the kueh for 6-8min. Depend on the size of the kueh. 8. 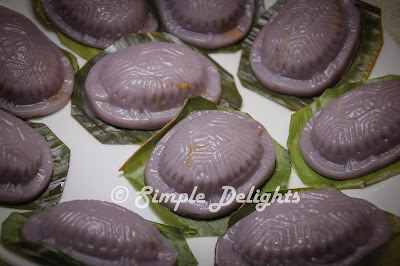 When the color of the kueh turn lighter it indicate the kueh is cooked. 9. Take it out from the steamer and cool it . 2. Blend the peanut with the caster sugar. 3. Let it cool down before used for fillings. As I grease the mold with oil , I did not brush oil before steaming the kueh. You can brush the kueh with oil before steaming it will prevent the kueh from sticking together and make the surface look glossy. 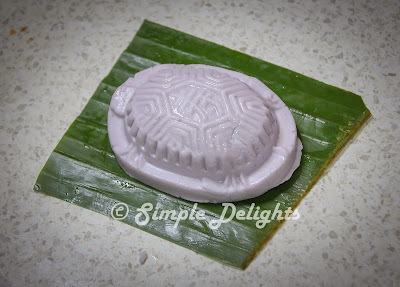 The texture of the kueh is soft and the coconut milk add frangance and it taste yum. I simply love the nature purple from the sweet potatoes. It make this kueh more appealing and just good for an afternoon snack . Started the food journey ever since I have to move away from my home.I miss the food I love back home and cant get in this big country town. However food have given me an opportunity to draw people closer and most of the heart to heart talking moment with friends at my dinner table encouraged me to continue this food journey. please link to the original blogs . Appreciate much .